I already review the body cleanser yesterday, if you want to check more about it, you can visit HERE. 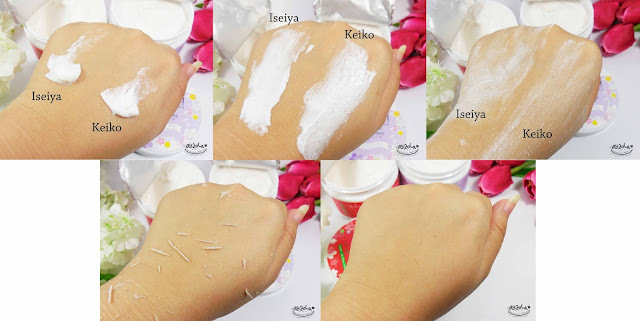 Now, i'm going to review the body scrub, Iseiya and Keiko variants, that totally amazed me. Want to know what so special about this body scrub? It's a dry body scrub! What it's it?? Check below, you won't regret it! 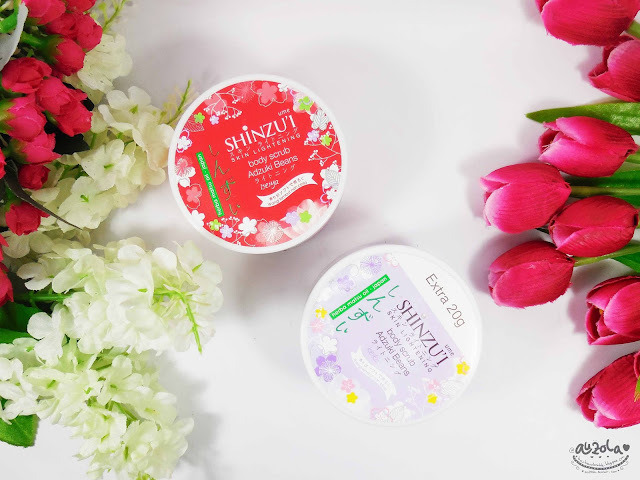 If you read my review about Shinzu'i Ume Body Cleanser earlier, you'll notice they have the same theme packaging; simple with sakura floral details all over it. Keiko and Iseiya body scrub also have the same small round packaging, with different color, Keiko is purple and Iseiya is red. But both are cute and looks kawaii in my eyes. Oh, i bought the Keiko one few days ago and it's extra 20gr! So more to use hehehe. What so special about this? 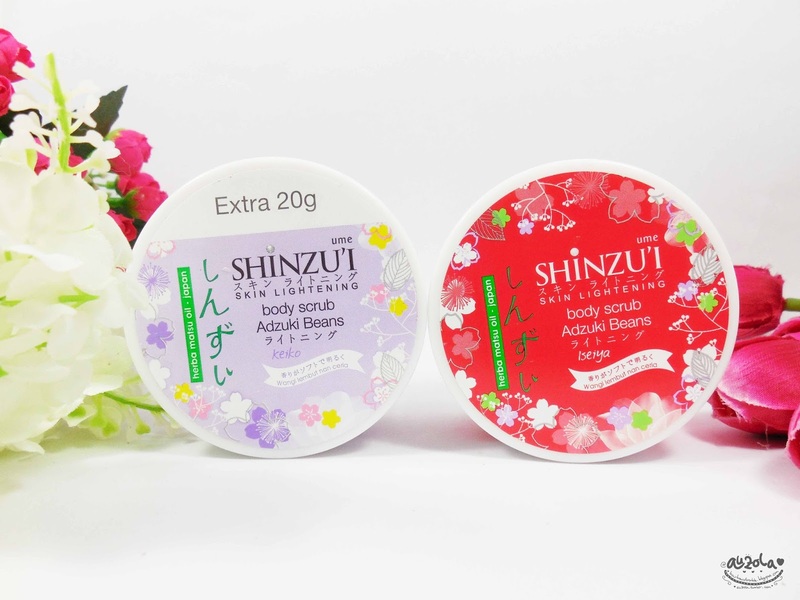 Well, Shinzu'i Ume Body Scrub Adzuki Beans is a dry scrub, means you can use it without have to rinse it! It's amazing or what? 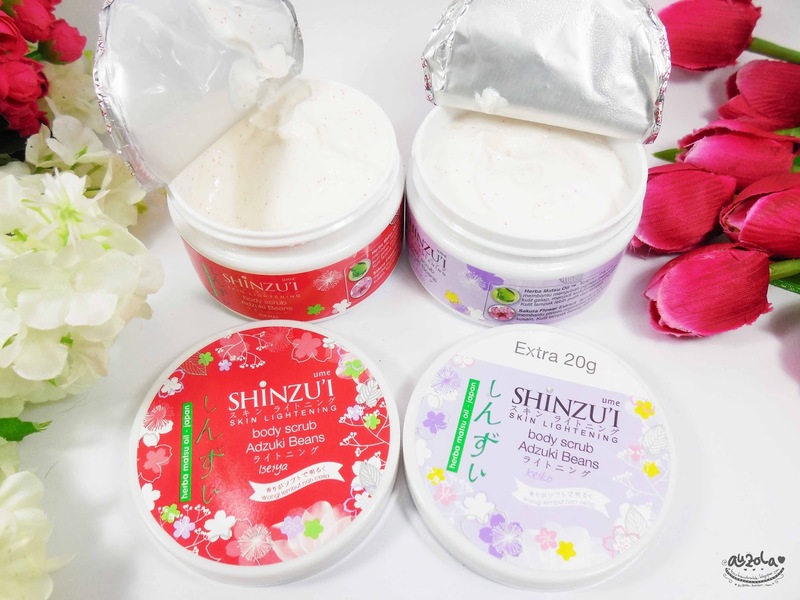 Plus it has a different from the usual body scrub from Shinzu'i Ume, which this one contain Adzuki Beans and Japanese Rice! Adzuki Beans help to remove dead skin cells and cleanse the pores from dirt and bacteria than can be damaging to the skin, which can darken our skin tone and make it dull. While Japanese Rice can help soften and brighten our skin so it'll looks naturally brighter and fairer. It's also already dermatology tested and said to be suitable for any skin type. You don't have to worry about getting a irritation from the scrub because the beads is perfect size and doesn't feel sharp on the skip. Plus it has moisturizer to help your skin to be softer and moisturize. Apply all over your skin (wet or dry doesn't matter) and scrub gently to get rid of unwanted dirt or dead skin cells, clean with tissue or with water. Well, basically it's the same with using normal scrub. The things that make it amazing is that we don't have to wash or rinse it (preferable though, you can wash it too if you want). All i need is rub and rub and tadaaaa, all the scrub residue will appear and i only have to dispose it to the nearer trash can. Easy and the result is good! If you notice, my hand after using the scrub is more brighter and whiter than before. But maybe because of the light you can't really see it, but i can see it alright through my mirror hehehe. Other effect? The skin feels soft right after it without any sticky residue feeling, just like using a really nice body lotion. And the skin stays soft and moisturize for a quite long time. I love it! As a lazy people and body scrub lover i approve! For a lazy people like me this scrub easily became one of my favorite hahahhaa. You know there are times when you're too lazy to take a bath but want to stay fresh and clean? This is the answer people! I love my experience so far, the only thing that i don't like is because i still have to dispose the scrub residue my self, lol, all of scrub do it. I have a lot of scrub in my house because i do love to scrub, but sometimes i'm lazy because the skin need to be dry or else the scrub won't work as good yadda yaddaa, that's why i'm in love with Shinzu'i Ume Body Scrub Adzuki Beans right away! Trust me, it'll make your scrub moment waaaayyy easily. Plus beauty tips from me, i totally recommend that you bring it daily on your bag. Why? 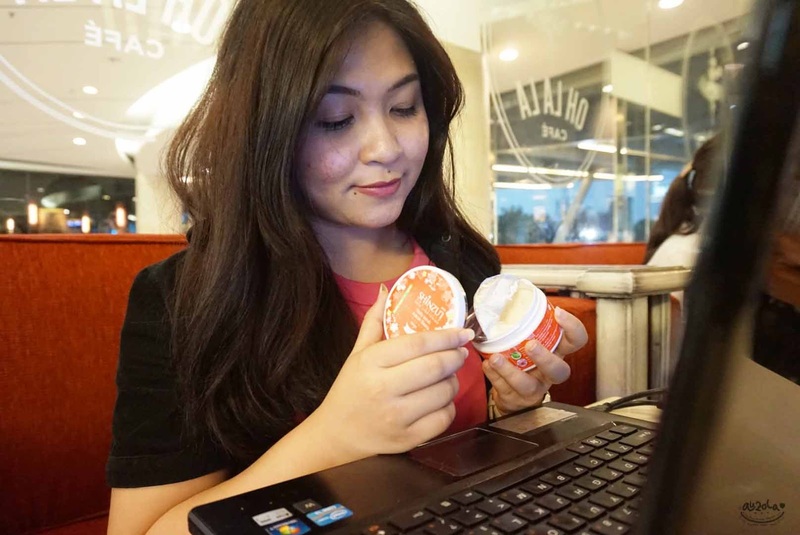 Sometimes we're busy all day that we don't have to take a bath on the office or mall or whatever, but in the other hand sometimes we have this unexpected plan like dinner night or whatever. Surely you don't want to appear like hell right? This might be the right choice for you guys. Especially you who are still in high school. I know how bad our skin feels after a long day at school, we can totally use this Adzuki Beans scrub to make our skin better anywhere and anytime. Oh oh, plus it's good to use when you're sick and can't take a bath. And don't forget to bring it while traveling! + no need to wash! yang bikin bertambah suka karena praktisnya itu yaa...tanpa perlu di bilas. Hai hai wanita 17 tahun hahhahahhahah, dan gw pun beli ahahhahahahhaha, trus langsung di keep ma babe *sigh hahahhaa. Babe ngga bisa liat lulur nganggur bzzzzz. With so many spa treatments on offer these days, choosing the perfect spa treat can be a tricky business. This article focuses on body scrub treatments, to give you an idea of what's currently popular.